The Pathfinders’ sandwiches – or lack of them – may soon, I hear, be a subject of a question in the House. 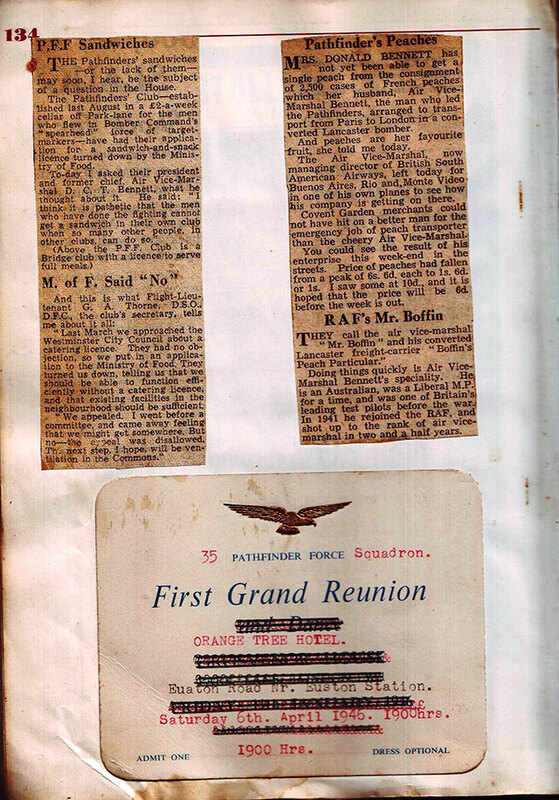 The Pathfinders’ Club – established last August in a £2 a week cellar off Park Lane for the men who flew in Bomber Command’s “spearhead” force of targetmakers – have had their application for a sandwich and snack licence turned down by the Ministry of Food. Today I asked their President and former chief Air Vice Marshal D C T Bennett, what he thought about it. He said: I think it is pathetic that the men who have done the fighting cannot get a sandwich in their own club when so many other people, in other clubs, can do so. And this is what Flight-Lieutenant G A Thorne DSO DFC, the club’s secretary tells me all about it all: Last march we approached the Westminster City Council about a catering licence. #They had no objection so we put in an application to the Ministry of Food. They turned us down, telling us that we should be able to function efficiently without a catering licence and that existing facilities in the neighbourhood should be sufficient. We appealed, I went before a committee, and came away feeling that we might get somewhere. But no – the appeal was disallowed. The next step I hope, will be ventilation in the Commons. Mrs Donald Bennett has not yet been able to get a single peach from the consignment of 22,500 cases of French peaches which her husband , Air Vice Marshal Bennett, the man who led the Pathfinders, arranged to transport from Paris to London in a converted Lancaster bomber. And peaches are her favourite fruit, she told me today. The Air Vice Marshal, now managing director of British South American Airways, left today for Buenos Aires, Rio and Monte Video in one of his own planes to see how his company is getting on there. Covent Garden merchants could not have hit on a better man for the emergency job of peach transporter than the cheery Air Vice Marshal. You could see the result of his enterprise this weekend in the streets. Prices of peaches had fallen from a peak of 6s 6d each to 1s 6d or 1s. I saw some at 10d, and it is hoped that the price will 6d before the week is out. 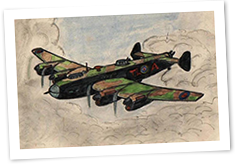 They call the air vice marshal “Mr Boffin” and his converted Lancaster freight carrier “Boffin’s Peach Particular”. Doing things quickly is Air Vice Marshal Bennett’s speciality. He is an Australian, was a Liberal MP for a time and was one of Britain’s leading test pilots before the war. In 1941 he rejoined the RAF, and shot up to the rank of air vice-marshal in two and a half years.